Numerous magic commands like run, whos, debug, reset, etc. Here I cover what you need to know to install and use ipython and ipython notebook comfortably if you’re transitioning from Matlab. I wanted to install the ipython Notebook on my Ubuntu 11.10 PC but the installation information I got on the ipython website was confusing/outdated. 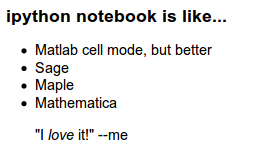 I can tell you this much: there’s no ipython-notebook package for Ubuntu in the main repositories. There is an ipython package but it appears to be an old version. 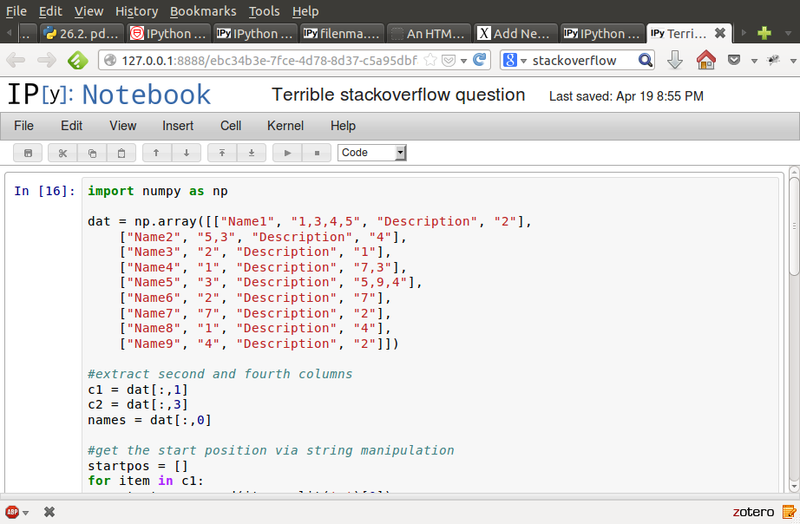 Starting ipython is as simple as running ipython at the terminal. The default mode gives you a regular ipython interpreter, but you will most likely want to use the --pylab flag, which will give you support for matplotlib. It appears to run from maplotlib.pylab import * and import numpy as np as well. Get help associated with a variable via varname? 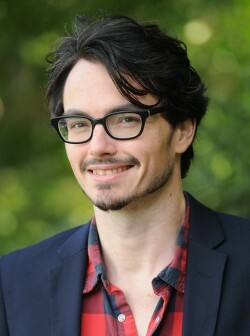 and varname?? %debug: runs the post-mortem (after an exception) debugger, pdb. Once pdb runs, you can type a single u and d to go up and down the call stack, and q to quit. 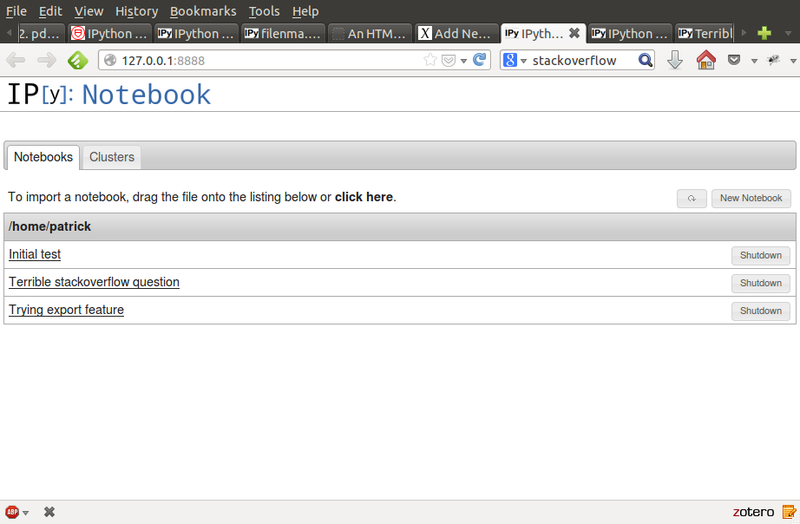 The ipython Notebook interface can be started from the command line via ipython notebook (requires ipython 0.12 or better). 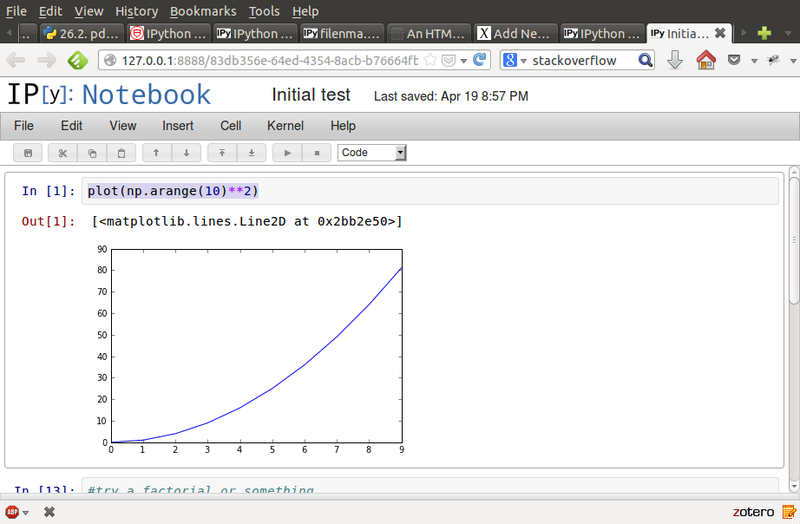 However, you probably want to open it with the flags ipython notebook --pylab --inline for integration with matplotlib. Notebooks can then be exported to regular Python as needed. It’s a really neat interface for writing self-documenting code and experimenting with new ideas – i.e. when you would use cell mode in Matlab, but better. It allows calling out from the notebook to matlab (with the %matlab magic and %%matlab cell magic), passing variables back and forth between python and matlab and in-line display of matlab figures. This can be installed from source (which can be downloaded in the above link), or using pip/easy_install.